Camping can be a great way to have quality family time and not spend your college savings! 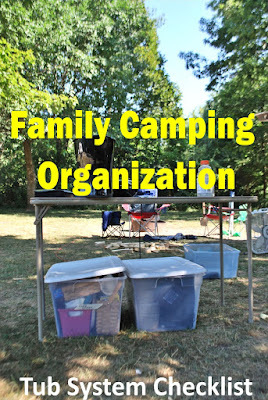 Camping can also be a great way to drive mom crazy and dad crazy with all the packing and meals you have to prepare. 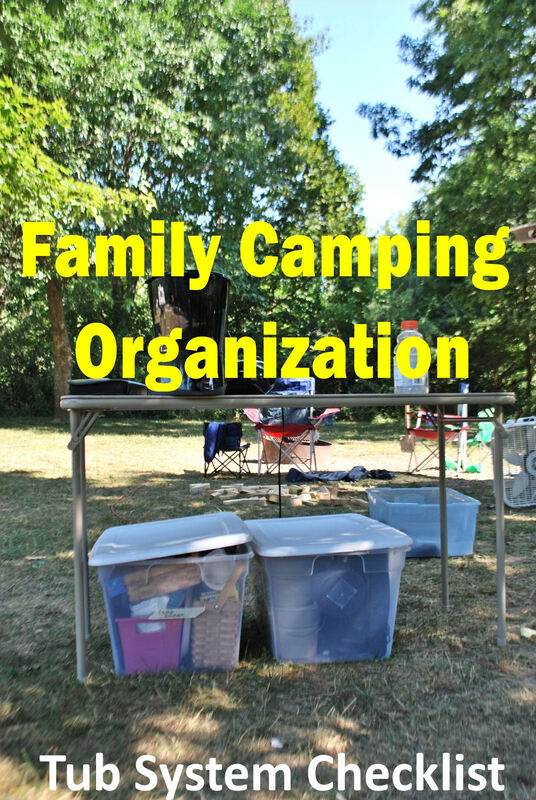 The way we enjoy family camping is to be as organized as possible. Organization also saves us money on last minute items we forgot. We use the Tub System to streamline the packing and unpacking process. I was sick of packing the same thing over and over every year, just to forget one important item that I could get from the dollar store, but now have to play inflated prices at the Camp Store. We use 20- gallon CLEAR tubs from Walmart. With my list (below) I bought and packed items from the dollar store or garage sales that STAY in the tub all year long. These tubs contain NO FOOD so they can be put under the table each night and no raccoons would get into them. TIP- Buy items from dollar store, and after each trip replenish items you used (trash bags, alum foil) so next time you can just pull out tubs and be ready to go. List for a Modern bathroom campground, plan accordingly if camping at primitive campground. Some of the items listed are bigger than the tub, but they need to be on a checklist somewhere. __ Pop up laundry basket- get one from dollar store, great for kids because they can throw dirty clothes in easier than having to find a bag. Some of these can go into camp site tub if room. I tend to put it in my big suitcase. Thank you for shopping affiliate links. They help me keep my blog open with no extra costs to you. Love this, I have wanted to use tubs and organization and started putting one together. I love this thank you! So glad it could be helpful to someone else! My first camping trip made me crazy because we didn't do a system like this. Now I look forward to camping! I have done tub camping for a few years but you have some great ideas that I'll be using when we goi camping next. Thanks for putting this together! Best Checklist ever. Thank you. i do the same thing with 2 five gallon buckets with lids; one is "camp kitchen" and the other is "camp bathroom".....you can put lots of stuff in those buckets. the kitchen bucket --empty-- becomes a sink, and the bathroom bucket, with a liner, a folding seat, and some kitty litter, becomes a potty. I keep these packed with everything on my checklist in the camping notebook...most of the things on your list, plus other stuff like: soft folding water carrier, solar shower bag, vinyl shower curtain, etc. Easy to grab and throw in the car! That is a great idea! The campground we go to has modern bathrooms and showers, but I will definitely use that bucket system if we go primitive camping!! Very useful and well done! We do this, and it works great! We use cheap plastic, reusable, plates and silverware instead of throw-aways. Great additions! We have the tarp rolled up with our tent, but they should definitely be on the list! Thank you! Thank you so much Becca!! !I thought I had replied earlier, sorry about that! I really appreciate you sharing!!!!! Just an extra note, I also use tubs to camp but I also pack our clothing in another tub to keep it dry! It works great and then we don't have 5 different suitcases or bags floating around too. I'm excited to try this out. I'm going camping for the first time in 2 weeks with some church friends. This takes the "overwhelming" out of getting ready to go! Thank you! This is a great system that works really well! I use clear packing tape to fasten a list of each tub's contents to the lid- no more rummaging around in the wrong tub. My favorite recent camping tip: get a cheap over the door shoe organizer with clear pockets, hang near your "kitchen" area, and fill the pockets with commonly used items. Utensils in one, napkins in another, salt and pepper in a third, and so on. Makes cooking and preparing for meals so much easier! Great idea - this is exactly what we do. Only thing to add is a check-list taped to the side of each tub (use the plastic page protectors) with the contents - that way everyone knows what is in the tub and makes repacking it that much easier. Blog information in this post are really wonderful. Tube camping is really great idea. It is always hassle to keep staffs in elsewhere. Clear tube is perfect for RV camping. This checklist rules! I hope that you can share some moving checklist? I am going to move to another town next year and I don't know what to take with me and what to leave. Most of my furniture are old and I won't take them with me, so I am completely confused! Thank you so much for the lists & tips! Good tip for the packing process! Thank! This thing is massive. I've seen other people on here saying that it's not as big as they expected. It was the complete opposite for me. Timber Ridge states it fits 8 people, and while it might be a little tight with 8 full sized adults, I don't think that's what was the intended use saying 8 people. But it could easily fit 4 adults and 4 children. I'm confident that you could even get two queen sized air mattresses in this thing, I believe one will fit in each half of the tend with the room divider up. One thing that stood out to me while setting this up is the thickness of the tent poles, they seem very durable and don't seem that they would break easily which is a problem I have had with tents in the past. Another awesome feature is that the tent also has these convenient cubbies, or pockets, around the entire top of the inside of the tent for storage. I shot the video and took the pictures in my yard for the purpose of this review. I will update soon once we actually get to take it camping hopefully in the next few weeks. From my first impressions I would not hesitate to recommend this to friends or family. Good ideas. I've sort of done similar but not all the way. I had a small closet where I used to store all the camping gear in one place.Then my husband took it over and our stuff is now scattered. I'm getting ready for a camping trip right now and could have used your ideas a lot sooner. But I do have most of my stuff dedicated strictly for the camping. With my numerous preliminaries and mistakes,Camping Meals for Kids I have concocted a wide range of simple camping meals and nourishment things all in all to bring along on camping trips.